OPTILOGG can basically be described as a ”compliance catalyst”, today indicated for heart failure patients. OPTILOGG helps the patient transition from being a passive recipient of health care, to an active part of the health care system, by coaching the patient to an improved self-care behavior. The OPTILOGG system consists of a specially designed software, which is run on a tablet and installed in the patient's home by CareLigo's staff. 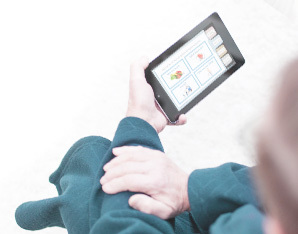 All necessary equipment (including the tablet) is provided by CareLigo. No prior experience in handling neither mobile phones nor computers is necessary to be able to use OPTILOGG. OPTILOGG rests on three pillars of intervention; Symptom monitoring, titration of diuretics and interactive education. The patient is thereby trained to become the expert at his/her unique situation. When that is no longer enough, and a deterioration in health status occurs, OPTILOGG identifies this and alerts the patient and also recommends him/her to contact his/her health care provider. Is there really a need for something like this? Yes, indeed there is! Any person who lives to be 80 years old, will consume one third of his/her total lifetime health care costs after that point. These are the patients who consume the most health care resources and a minority of them have access to the internet. A minority. That is very important to keep in mind when talking about eHealth-solutions that are supposed to handle the ever ageing population and distribute health care. OPTILOGG is the only solution of its kind that really reaches these patients. If we focus specifically on heart failure we see it is one of our most expensive diagnoses and the most common cause for hospitalization for people over 65. It turns out that unsatisfactory self-care behavior among these patients is the reason for about 50% of these hospital admissions. Half of these costly admissions, with all the human suffering they entail, could have been avoided. That is why there is a need for OPTILOGG. Which health care providers/organizations stand to benefit from OPTILOGG? OPTILOGG is used today by several different organizations spread out over ten of Sweden's 21 counties. A hospital will benefit from the redistribution of acute health care to planned health care, reduction in requirements of in-hospital capacity, and also a more efficient pateint interaction. An increased productivity with less waste is a direct consequence of the introduction of OPTILOGG. For primary care, where the largest group of heart failure patients are being cared for, OPTILOGG adds value in several ways. Since the patients are alerted to a precipitation with ample time to react, the patient can be scheduled for a visit during office hours. Reimbursement models vary from country to country, and often times even county to county, so feel free to contact us directly to learn more about how OPTILOGG can generate profit in your specific situation. Given that OPTILOGG includes actual patient data (symptoms, medication, well-being, etc), the meeting with the patient will be more efficient and the patient will be easier to treat. OPTILOGG is very popular among its users, so several of our customers use OPTILOGG as a means of attracting patients, and then retaining them. Even advanced home care for NYHA class IV-patients stand to benefit from using OPTILOGG, as the can either reduce the on-call staff, or sign up more patients with the existing organization. Lastly: OPTILOGG is the only solution of its kind. OPTILOGG is CE-marked as a medical device (class 1m). OPTILOGG has been validated in two randomized clinical trials, where a significant improvement of self-care behavior as well as a statistically significant reduction of in-hospital days by 29%, were shown. OPTILOGG is also unique in the sense that it does not add to the work load of the health care provider, since no data is sent upstream, but the focus in entirely on empowering the patient, and making him/her an active component of the health care organization. OPTILOGG is provided as a subscription, meaning that our customers will never have to make large upfront investments, and also means that CareLigo handles all maintenance and technical support.